“The romance inherent in everything, particularly science and knowledge. The more the person knows, the sharper it sees, the more closely it surrounds poetry And the happier he is”. These are the words of a wonderful writer and great soul Konstantin Paustovsky. And they involuntarily come to mind when acquainted with the Affairs and dreams of boys and girls working in the clubs of the regional station of young technicians of the Crimea. Here is “the Seeker” — one of the country’s first youth scientific societies. In Crimea, it is called MAN — Minor Academy of Sciences. The reputation of the society was so wide that even the very promising name — the Academy has long ceased to embarrass anyone. By the way, game of academicians, corresponding members and other senior academic titles here and there never was. The essence of the Crimean Academy is not in it. Any business, great and small, is determined, first and foremost, its content, character. And they the Crimean obsut the most that neither is creative. MAN is a form of Association of infantile aspirations, centralization in assisting in the development of creative abilities and focus of scientific and technological search. It consists of sections in physics, chemistry, mathematics, Cybernetics, biology, history and study. Good years of glory established for young astronomers of Crimea — they are presented in the “Finder” powerful group. But the most massive section in a MAN — engineering. Graduate engineers here, of course, not all members of the section — students. But the results, they say, at the level of serious engineering development. A characteristic feature of many groups of the region — close contact with production, with labor groups. Increasingly work of guys heading tasks of enterprises, institutions, kolkhozes. And a lot of technical innovations, created with their hands, put into production. For example, at one of the plants of the Crimea is successfully apply a photoelectric counter, designed by members of the SAS by Mordashovym Vadim and Sergei Chernyshev. The device replaces the record-Keeper and gives the production per year 900 rubles savings. Kerch students, even members of MAN, Serge Abdulkin, Yura Semenov and Mike Imams together with adults participated in the design of automatic measuring system of water level for the processing plant. The guys have calculated and designed the device that produced the layout and working model. After the test model, the specialists have produced an industrial installation, which works perfectly at the factory. Offer young technicians recognized as innovative, was. The economic effect of its implementation amounted to more than a thousand rubles a year. Here’s another interesting example. Last winter the traffic police of the city of Simferopol appealed to young technicians with a proposal to come up with an automatic switch-flashing lights to traffic lights. Essentially needed to create the light of the new design. With the help of the head of the circle V. P. Shevchenko guys did the job pretty quickly. But experiment is experiment, it was necessary to check: the new machine with the consent of the traffic police have set up nearby, in the same quarter, where the station of young technicians. Carefully watched his action. With enthusiasm came from the guys at creation (by the order of the regional sanitary and epidemiological station) of an electronic device for… repelling mosquitoes! 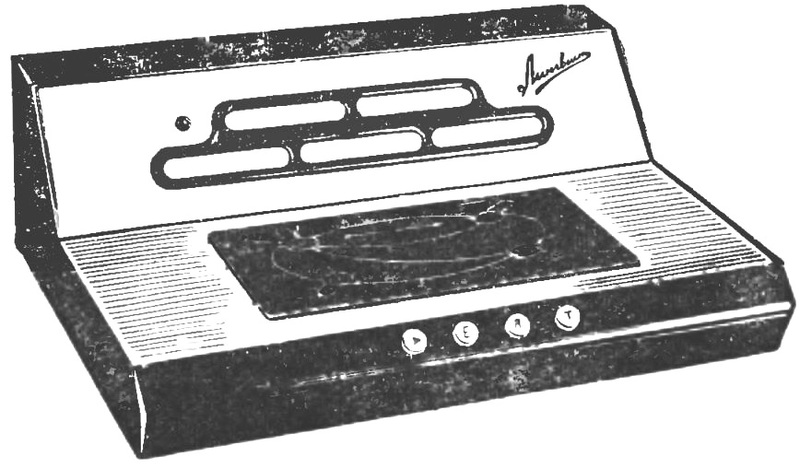 The principle of operation of the device will be based on the emission of electromagnetic waves of a certain frequency. It is the one which mosquitoes can’t stand. The new device is nearing completion. And these guys will get their way. You can imagine how great will be the demand for such a device in people of different professions: geologists and foresters, loggers, and rivermen, builders. Finally, just tourists, hunters, fishermen! The creativity of young technicians of the region represented at the USSR exhibition in Moscow, saw their work among the Soviet exhibition in Montreal and Santiago, Osaka and new York. Crimeans say: “MAN “Finder” is not an artificial add-on school, a continuation school, and most importantly in her work — educational and educational function”. And usually this idea develop like this: if the MAN — the school, her cybernetic section of his kind school-new building, the school that promotes the foundations of Cybernetics in the classroom. 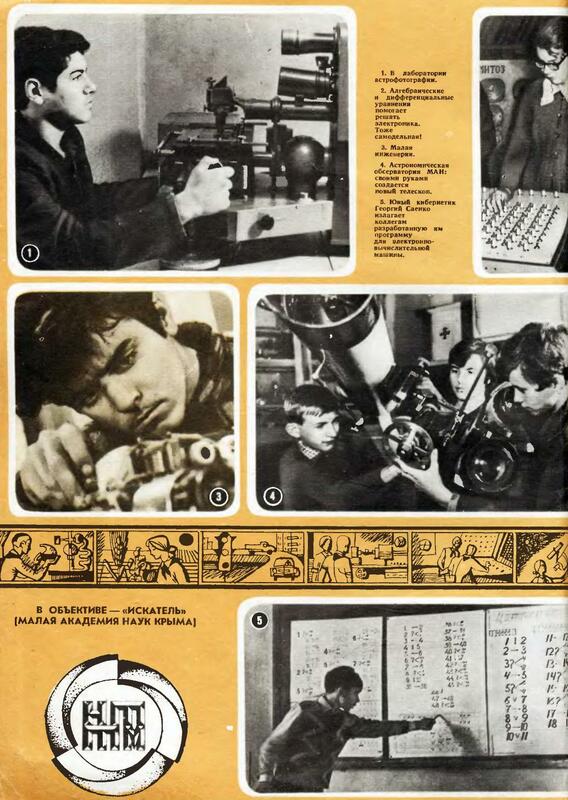 Ten years ago, when the potential of the young generation the basics of Cybernetics to many seemed questionable, in the Crimea began experiments to systematically familiarize students with the basics of this science. The initiative of young technicians then strongly supported scientists: above section young Cybernetics “Finder” took patronage Scientific research Institute of Cybernetics of the Academy of Sciences of Ukraine headed by academician Victor M. Glushkov. Commonwealth schoolchildren, educators and scientists gave interesting results: a joint effort was established and approved course introduction to Cybernetics. Plus developed teaching methods of Cybernetics in the school and, crucially, designed for all, business training and visual AIDS, which still didn’t exist. Thus, fully armed came to light and decisively declared itself the newest, most modern school subject — school Cybernetics. 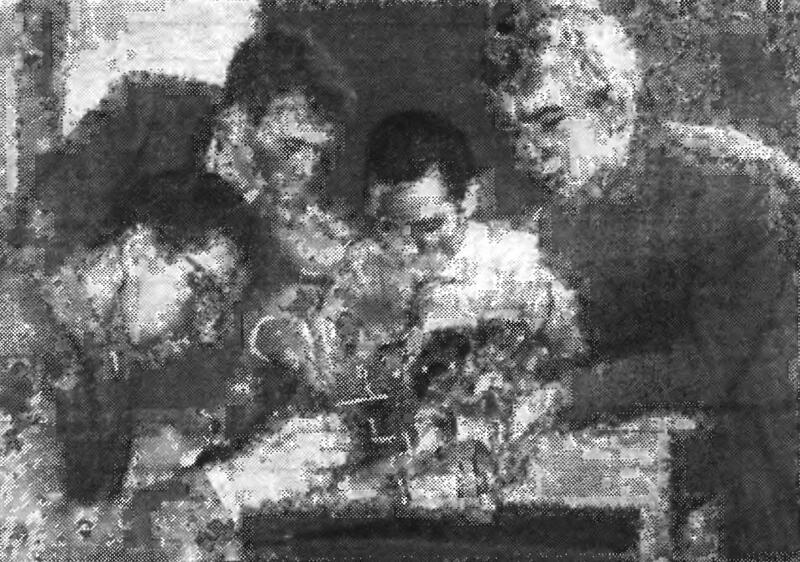 Section of young computer scientists “Seeker” has today more than a thousand people of full — time and correspondence students. Right here written and kind of the popular books “Secrets of Cybernetics”, “Cybernetics ABC”, widely known both in our country and abroad. Collections of problems and exercises in Cybernetics released for students enrolled in the correspondence school the “Seeker.” Now comes a new book, “the Elements of Cybernetics — student”. The design of the course “school of Cybernetics,” the organizers of this case is absolutely clear that master guys start new, especially the application of science only from books or using the “chalk” method of teaching is almost impossible, can not do without special equipment. Fig. 1. Post machine, constructed on chips. — Perhaps the most significant contribution of children themselves in the creation of a training course on Cybernetics must be considered in their design work, — the President of the MAS associate Professor of the Crimean state University Valentin Nikolaevich Kasatkin. — All the visual AIDS that we use today, made by the children. This is eloquently demonstrated by three dozen medals of the USSR, which was noted in recent years, the success of young Cybernetics of the Crimea. Convincing figure, do not say anything! Development of visual AIDS, modeling, and design had hundreds of children-members of Macs. 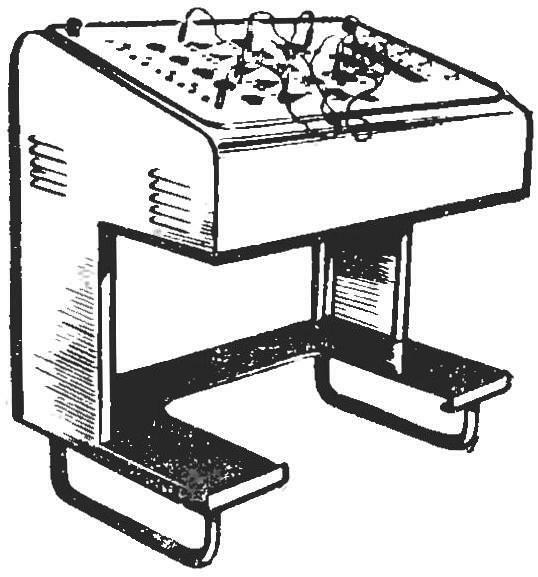 And created with their hands about 70 devices, apparatuses, machine — learning-visual AIDS in Cybernetics. Some of them will be part of the mandatory training equipment for those schools that have already introduced the basics of Cybernetics. The Ministry of education of Ukraine gave instructions to deliver such benefits to schools of the Republic with textbooks certainly in Cybernetics, established on the basis of MAN. Each set of equipment — set of textbooks per class. A very wise decision! It is difficult to overestimate the importance of the work being done in the cybernetic section of SAS, its relevance to the preparation of children for independent creative work. Undoubtedly, this work is career-oriented because the profession is “Cybernetics” (this assumes, of course, “mathematician”, “programmer”, “computer”, “electronics and many others) is getting massive. — Still, I think this is also the main guys, learn to think, learn to conduct a scientific discussion, work with a scientific book, — says the student of the MAN, and now her “full-time” Executive Secretary Anya Lomakina. — Of course, not all members of the cyber section definitely associate their future with this science. But one thing is certain: the methods and techniques of research, ability independently to extract knowledge, passion for creativity — it all lies a solid Foundation in life the baggage boys and girls, the leaving MAN. Example of their successful study and work in manufacturing, particular, I must say, the attention to students with “manowski” experience in selection committees of institutes and universities. In the Crimean University, for example, our children are almost out of the competition: extensive knowledge and skills beyond the school curriculum provide a solid additional point. Science is precisely such personnel and necessary — first of all able to think and translate thoughts into deeds. Remember here Koda Bernard, who claimed that “the experimenter should be together and a theorist and practitioner, it would be impossible to separate these two things: head and hand — a skillful hand without the head, it management — a blind instrument: the head without the hands, which would carry out, remain powerless.” The creativity of scientific and technical, available to any of our children, — a fertile soil for the optimal combination of these qualities in a man. which is called Black, is situated the summer residence of “the Seeker”. It is based on normal camp young technicians the Department of education. But unusually the contents of life of its inhabitants. As with any summer camp, here in the first place, of course, the kids ‘ health, activity. The Macs are not less than others like to play volleyball and basketball, swim and dive, walk on the boat. But in the camp of the “Seeker” all this combined with interesting work — serious science and technology. Here on camp fees Junior Academy, sent to meet with the guys of its scientists, many scientific research institutes of Moscow, Kiev and several other cities. Among them are the institutes of physics, Cybernetics, chemistry, physics, semiconductors. Come to camp and University professors. Two or three hours a day the Macs classes. Discussed new scientific and technical problems, protected projects, various hypotheses are discussed, analyzed, and communicated to “condition” the results of independent experiments. You may continue your studies winter and summer: in the camp organized laboratory of Cybernetics, chemistry, physics. Fig. 2. “The range of logical structures” for the development of Cybernetics in schools. In some extent. But more — seekers. And they do “something” found it! 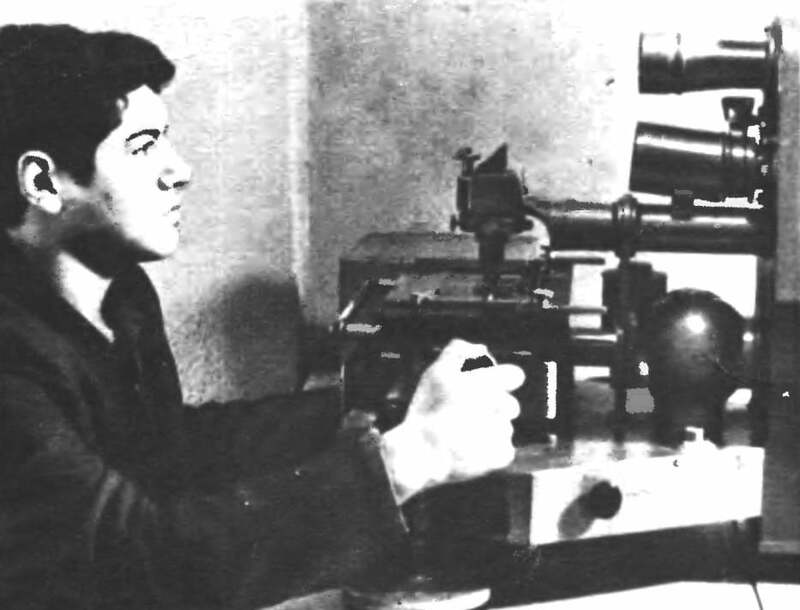 The young astronomers of Crimea was mentioned in the reports of the Soviet representatives at the XI and XII sessions of the General Assembly of the International astronomical Union, at the all-Union Plenum of the Commission on comets and meteors, all-Union congresses astronomicheskogo society (“VAGO”). Pictures of meteor spectra obtained with the Crimean children in the international astronomical catalogue published in Canada. A few years ago a group of young astronomers-“planetoidal” was awarded the special prize of VAGO. From the astronomical section of the “Seeker” now neither more nor less than 26 branches. From them 11 — in the Crimea, and 15 outside the region in Bodaibo and Suzdal, Saratov, and Kherson, Krivoy Rog and Frunze, in the Donbass, and even on the Amur river. Crimean meteor expeditions often become the Union, and the wide communication of the organizers with the young astronomers other cities in the country have made the expedition extremely valuable, sometimes unique. More than fifty articles in scientific journals — here is a sample, so to speak, the “official” research astronomers measure the “Seeker.” Articles written by children and recognized more science! Astronomical research cannot be carried out without specially designed equipment. But these are very expensive, and rare. As came out of the Crimean guys? The right way to go — did themselves. Designed astronomical instruments and equipment with the help of scientists and engineers, and produced his own. Until giant — in diameter to 550 mm — telescopes Here to you and “stargazers”! There is a distinctive way of scientific knowledge: from research facilities to the research, conclusions and scientific generalizations in the form of at least performances in academic journals, which fixes the priority of discovery. Fig. 3. Automatic “Linguist”: he translates from English into Russian. And help guys the Crimean colleagues not only experience and good advice — in dozens of Amateur telescopes of the astronomical clubs of different cities of the country are mirror lenses made by the members of Macs. It is the concern of the companions brings (“feedback”) benefit primarily the residents of the Crimea, as grateful to colleagues helping them with their participation in research, expand the scope of observations of the sky. In General, the direct use of domestic and world science! Such outstanding achievements of young astronomers have been possible due to constant hot and the support of many organizations — regional Committee of Komsomol and the Department of education, newspaper “Young Leninist”, scientific institutions. Support not only moral but also material. And of course, our wonderful scientists — corresponding member of the USSR Academy of Sciences V. V. Fedynsky, Professor V. K. Prokofiev, and many others, as well as enthusiastic teachers — teachers of the Crimean schools. “Remember, after you open, though the least!” one of the commandments, “the Seeker”. The main requirement to the members of MANS, to be creative. In every sense of the word! Scientific society of students covered not only the city but also rural areas. To unite and lead in the work of Amateur science and technology in the city is incomparably easier than in the villages, — said the Director of the regional station of young technicians E. P. Nevitsky. — City schools have the opportunity of direct contacts with universities, research institutions, scientists of various rank. Rural guys are deprived of such benefits. And it is here that affected organizing role of MAN. In the districts of the “Finder” has its branches. Their base are local syt (a phenomenon that is characteristic only for Ukraine), House of pioneers and some schools. But is it always under the power of the district branch to host all sections of MAN? No. And the reason is often the lack of necessary technical base (equipment, devices), lack of knowledgeable managers. Especially to practice Cybernetics. But interest in this science among rural children no less than their urban counterparts. Where is the exit? In MAN, a correspondence school of young lovers Cybernetics. For students this school once a month consultations in Simferopol. Come to them, mostly rural folks, and even the most remote areas of the region. The numbers that are reported to us on obsut look convincing: of 623 pupils of the correspondence school 359, more than half of the boys from the village. It is only the residents of the Crimea. But in school a lot of students from other regions of the country. For young cyberneticists regularly hosts regional competition summarizing their work for the year. And it is noteworthy that they arrive full participants children from Donetsk and Zaporozhye, Nikolaev and Poltava, from different republics of the country. They are all students of the correspondence school of Cybernetics. But the organizers of the MAN was not satisfied: the district branches and of the correspondence school was followed by another novelty — the creation of school offices the “Seeker.” It started just two years ago, and today in Crimea there are more than 50 such offices. Thus in the region there is a streamlined and effective system of scientific and technical creativity. 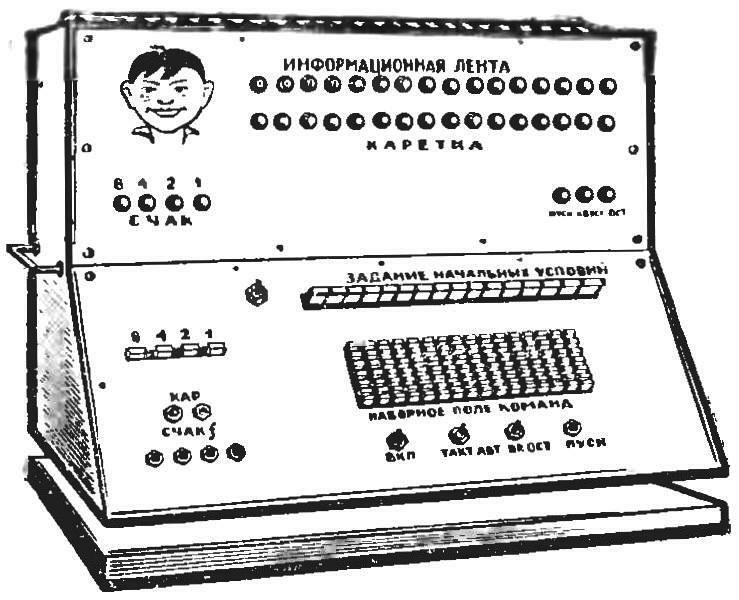 — Developed in MAN special educational devices such as “Polygon logical structures”, Post machines and Turing machines, simulating the conditioned reflexes, look for the original technical solution and execution, — reported edition E. P. Nevitsky. The first three have already been taken into production, they begin mass production. Cybernetic devices produced by the plant will soon have schools, universities and technical schools. This is a concrete contribution of our boys in the five-year period, their gift of the XVII Congress of the Komsomol. Yes, of course, on the eve of the Congress in the days of the all-Union review of children’s non-school institutions, which is dedicated to the 50th anniversary of the assignment of the Komsomol and pioneer organization named after V. I. Lenin, the Crimean obsut, her wonderful staff have achieved outstanding results, significant events in the life of Lenin Komsomol and all Soviet youth met adequately. Y. STEPANOV, our special. Q.